Free-roaming cats, both feral and stray, are the most significant source of cat overpopulation. They produce approximately eighty percent of the kittens born each year. Feral cats are often confused with stray cats, but there are significant differences between the two groups. Stray cats are tame pets who are lost or abandoned. They are accustomed to contact with people and may be reunited with their families or adopted into new homes. Feral cats are the offspring of lost or abandoned pet cats or other feral cats who are not spayed or neutered. They are not accustomed to contact with people and are typically too fearful and too wild to be handled. Feral cats who have spent their entire lives outdoors can sometimes adapt to indoor life, but attempts to tame adult feral cats can divert time and energy from the most important objective: reducing the free-roaming cat population. Reducing the number of free-roaming cats and managing their care is the goal of Trap-Neuter-Return (TNR). 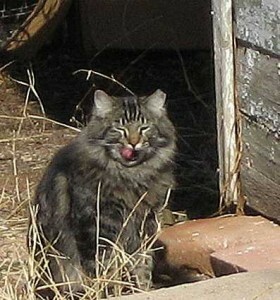 The basics of TNR involve trapping the cats in a colony, having them spayed or neutered, vaccinating them against rabies, identifying them with an ear tip, and returning them to their original territory where a caretaker provides regular food and shelter and monitors the colony for newcomers and any problems. Ear tipping is a procedure where a quarter inch off the tip of the left ear is removed in a straight line cut (performed while the cat is anesthetized during spay or neuter surgery). It is the only reliable method known for identifying a spayed or neutered feral cat. The TNR process also allows for friendly cats and kittens to be identified and sent to adoption and foster programs, causing an immediate reduction in the number of free-roaming cats in the area. TNR begins with the trapping of feral cats using humane cage traps. The captured feral cats are taken (in the trap) to a TNR spay/neuter location usually run by a local animal charity facility where they are sterilized by the neutering of males and spaying of females. Our TNR program also provides the cats vaccinations against rabies. Finally the cat is marked by “ear tipping”, cropping 1/4 inch (6 mm) off of the tip of the left ear, so that it can be easily recognized as having been sterilized and as a member of a managed colony, so that the animal is not subjected to unnecessary surgery, confinement or euthanasia. After the procedures, the cat is placed back in the trap and allowed to recover from surgery. Then, the cat is returned to the newly-controlled location where it is observed and cared for with food and water by the volunteer colony caretaker. TNR is promoted by the ASPCA as a humane and more effective alternative to euthanasia for managing and reducing free-roaming cat populations. Euthanasia on a massive scale is not fiscally practical. TNR advocates agree that the traditional methods of trapping-and-removing will not work. Click here for information on how to spay and neuter through our program. UPDATE: 3 cats adopted, 3 new foster homes recruited! VTNR gets calls daily from people who have found newborn kittens with no mom, stray moms with kittens, and older kittens just weaned and wandering. - abandoned newborns needing bottle feeding. Sign-up now for any VTNR announcements!